Pompano Beach is a substantial town on the southeast coast of Florida that is part of the Miami metropolitan area. This amazing area boasts one of the most beautiful beaches in all of southern Florida. Fine golden sand stretches out 100 to 150 yards wide as the beach runs down the Atlantic just north of the Hillsboro Inlet. There is plenty to do in this coastal paradise. Pompano Beach was named after a species of in-short tropical game fish, so fishing is always an easy choice, as well as other water activities such as boating, jet-skiing, parasailing, wake boarding, diving, and more. Non-water related recreation includes shopping, playing golf, and watching sports, as Pompano Beach is just a short drive from the homes of the Florida Marlins, Florida Panthers, Miami Dolphins, Miami Heat, and the Miami Hurricanes. Plenty of famous athletes live in the area as well and can be spotted on occasion. With so much to offer, Pompano Beach is pretty close to paradise, but the pros of Florida living are accompanied by cons as well, which include extreme temperatures, regular rainfall, and vulnerable soils that can put at risk the beautiful living and working structures that so many visitors and locals alike enjoy. The potential pitfalls the structures of Pompano Beach face include foundation problems, sinkholes, and seawall erosion. However, with our professional Pompano Beach foundation repair, sinkhole remediation, and seawall repair services, Solid Foundations restores carefree living to the people of Pompano Beach. The weather in Pompano Beach feels pretty much wonderful all year round due to the fact that Pompano Beach enjoys a tropical rainforest climate. This type of climate allows for perpetual blissfully warm temperatures, but it also produces an almost overwhelming amount of rainfall. The rains of Pompano Beach are almost overwhelming because the oversaturation of the soil that can result from constant heavy rains can put an excess of pressure on your foundation. This pressure is called hydrostatic pressure, and it can push the stress levels of your foundation beyond those of which they were designed to handle. When your foundation feels too much pressure, it is likely to crack, and these cracks can cause your house to shift and settle as well as permit unwanted water, insects, and creatures to enter your home. However, cracked, shifting, or settling foundations can lead to even bigger and more expensive problems than these, such as total foundation failure, so as soon as you see the signs of problems with your foundation, do not hesitate to contact Solid Foundations for our Pompano Beach foundation repair services. The signs that should tip you off to foundation troubles include sagging or sloping floors; cracking or leaning stairways or chimneys; gaps around doors, windows, and garage doors; bowing or leaning foundations; and puddles of water appearing around your property. The foundation repair services of Solid Foundations are just what you need to address these signs and the foundational problems to which they are connected. With our supply of steel push piers, helical piers, resistance piers, slab piers, wall anchors, cement grouting, and polyurethane resins, combined with our years of experience and training, we are more than prepared to stabilize your foundation and get your home back on solid ground. We use these products to transfer your foundation to more dependable soils, and we do so with the most knowledgeable and friendly customer service. For the people of this wonderful part of Florida, Solid Foundations is always ready to supply our Pompano Beach foundation repair services. The foundation of our Florida landscape consists mostly of porous limestone, and this means that the foundations of our Florida homes and businesses can experience threats to their strength and security in the form of sinkholes. The problem with porous limestone and the reason for its tendency to form sinkholes is that it erodes easily under the constant flow of the acidic rainwater that enters the ground after the regular afternoon rains of Florida summers and hurricane seasons. As the limestone erodes, its layers are slowly removed from the bottom to the top until only a thin layer is left to support whatever is resting upon it, and the appropriate amount of pressure can cause this layer to form a sinkhole by collapsing and taking down its occupants with it. Therefore, due to how widespread the limestone bedrock is beneath the surface of Florida, most of Florida’s towns and cities are susceptible to their presence, including Pompano Beach. Sinkholes have been recorded all throughout Florida, including in the area around Pompano Beach, so residents should be prepared to encounter sinkholes by knowing the signs of their development and by knowing who to turn to when they see these signs. These signs of sinkholes should be known and respected as an immediate need to call Solid Foundations for our Pompano Beach sinkhole repair services. The professionals of Solid Foundations have years of experience solving sinkhole problems, and our repair methods of compaction grouting and void filling are fully capable of stabilizing the soils under and around your home and minimizing any damage to your property. The thick mixture of cement and grout that we add deep into the soil for our compaction grouting permeates the voids in the soil in order to increase the load bearing abilities of the soil and to seal the top layer of limestone so as to prevent any future complications. The high strength polyurethane foam we injection into empty spaces beneath concrete slabs and behind below grade concrete structures steadies the concrete against any outside forces and leaves the soil extremely sturdy. With our Pompano Beach sinkhole remediation services, the residents of this lovely Florida area can live without fear of sinkholes. The expansive sands of Pompano Beach are not the only place to enjoy living with the water: the miles of canals and access to the Hillsboro Inlet also allow for Pompano Beach locals to get close to the water. Prime waterfront properties are a considerable benefit of life in Pompano Beach, but as these properties rely on seawalls to keep the water away from the houses, they are not without their issues. Usually, seawalls are very effective structures that preserve the safety and security of homes bordered by water, but that very water can also cause these structures to suffer. The endless battering of the waves, winds, and unfavorable weather can inflict the deterioration of seawalls, and such deterioration can endanger the very things that seawalls are designed to protect, such as our homes, families, and communities. Therefore, when your Pompano Beach seawall is struggling to keep your place dry, you can rely on the seawall repair services of Solid Foundations. When you see these signs, you know that Solid Foundations is your Pompano Beach seawall solution. Our Targeted Grout Injection process rescues your sinkhole by injecting the leaks and voids in and around the seawall with a hydrophobic grout that seals the leaks and fills the voids by forming a rock-hard, waterproof mass without diluting in its watery location. The low viscosity, high expansion rates, and ability to cure under water enable our hydrophobic grout to improve the strength and security of your seawall and your peace of mind about your waterfront property. The Pompano Beach seawall repair services of Solid Foundations are what the seawalls of Pompano Beach need, so depend on us for the sake of your home and family. 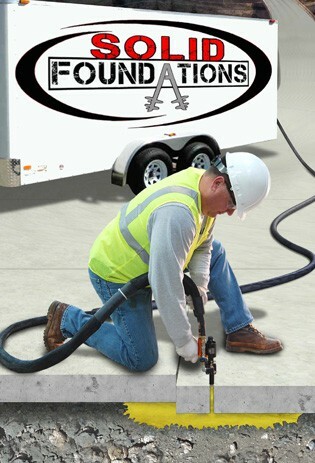 Our mission at Solid Foundations is to solve the foundational and structural problems of the people of Pompano Beach, so contact us for our foundation repair, sinkhole remediation, and seawall repair services, but also remember us for our French drain installations, pipe and structure leak repair services, slab lifting and level services, and soil stabilization services. With these services and more that can meet the needs of the homes and businesses of Pompano Beach, Solid Foundations can put the foundations of Pompano Beach back on solid ground.